Erufosine is an ether–lipid-derived synthetic compound belonging to the group of alkylphosphocholines (APCs). This chemotherapeutic agent exhibits pronounced anti-leukemic activity without affecting the normal hematopoiesis and exerts its influence by modulating signal transduction pathways in malignant tumor cells. However, the exact mechanism of action of this membrane-seeking compound is not fully understood, it includes modulation of different signal transduction pathways through interaction with membrane components. A systematic approach was used to decipher the mode of action of erufosine in oral squamous cell carcinoma (OSCC) cell lines. A gene expression analysis was carried out in a time and dose dependent manner on OSCC cell lines to look into unexplored and novel molecular targets and signaling pathways affected by erufosine, which would help in explaining its anti-neoplastic activity and assessing its clinical potential. Fig. 1. Pictorial representation of erufosine’s action on HN-5 OSCC cells. (a) Depiction of what happens in untreated HN-5 cells where the Akt pathway is activated and inhibits the suppression of RhoB. 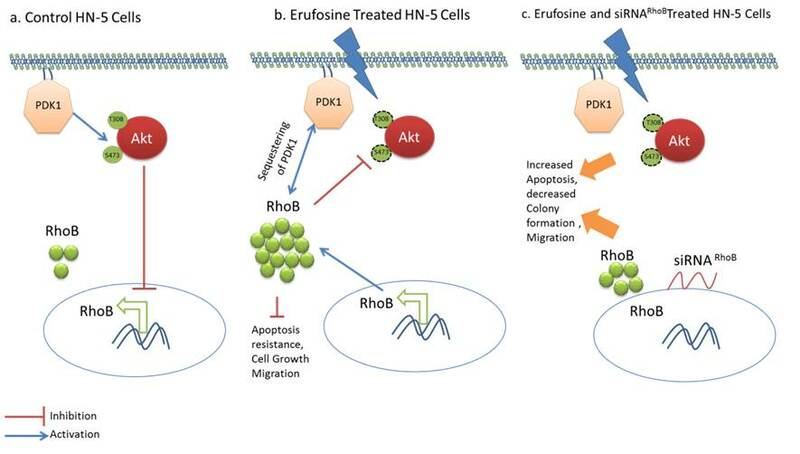 (b) When the HN-5 cells are treated with erufosine, a down-regulation of the Akt pathway is seen as well as up-regulation of RhoB mRNA and protein levels, which as hypothesized may be responsible for the cytotoxic effect of erufosine and cause inhibition of apoptotic resistance and migration. (c) Simultaneous treatment of HN-5 cells with erufosine and siRNA causes even increased apoptosis and decreases the migration of the cells even more. The microarray findings revealed that erufosine treatment causes up-regulation of RhoB expression in OSCC cells. The increase in RhoB expression was seen at both, the mRNA and protein levels, in a dose dependent manner when treated with erufosine. These observations indicated that RhoB might contribute to the antineoplastic activity of erufosine. The working hypothesis was that the combination of knocking down RhoB with siRNA in HN-5 cells and simultaneous treatment with erufosine would help in delineating the role of RhoB in the mode of action of erufosine. As expected, an inhibition of RhoB was seen at mRNA and protein levels, when HN-5 cells were transfected with siRNARhoB. It is well known that activation of Akt protein reduces RhoB expression in tumor cells. In line with this, the protein levels of pAktT308 and pAktS473 were increased in response to RhoB knockdown. Furthermore, in response to erufosine treatment, there was a decrease in protein levels of pAktT308, pAktS473, and PDK1 in HN-5 cells, whereas the protein level of Rho B was increased, suggesting that erufosine inhibited the Akt pathway causing increased RhoB expression. The combined exposure to both siRNARhoB and erufosine surprisingly caused only a slight reduction in RhoB expression as compared to erufosine treatment alone. We carried out functional assays after siRNARhoB knockdown with or without erufosine treatment. The combination of both treatments showed an additive effect, as seen by the colony formation and trans-well migration assays, respectively. Also, the percentage of apoptotic cells was additive in nature in response to combination of erufosine and siRNARhoB knockdown, as perceived by the cell cycle analysis using PI staining. As activation of Akt reduces RhoB expression and reduced levels of RhoB release the sequestration of PDK1, this mechanism will in turn increase the levels of activated Akt (Fig. 1). This reported phenomenon is seen when RhoB was knocked down in the OSCC cells. But the additive antineoplastic effect, which was observed after concomitantly treating cells with erufosine and siRNARhoB, indicates that other signaling molecules are involved in the mode of action of erufosine. This cellular response may be a part of a general mechanism caused by alkylphosphocholine- induced membrane perturbation. The increased RhoB expression in response to erufosine may not be a central part of its mode of action but can aid in slowing down cellular properties, which are considered vital parts of cancer progression. Erufosine increases RhoB expression in oral squamous carcinoma cells independent of its tumor suppressive mode of action – a short report.